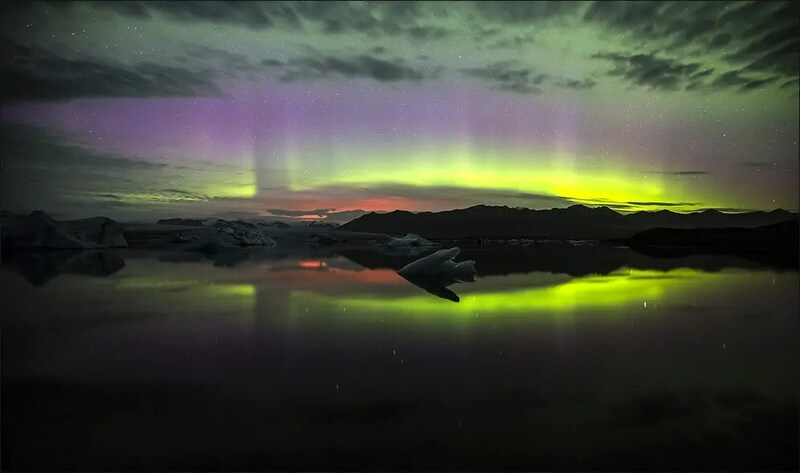 Glow from the volcanic eruption in Holuhraun is reflected in the Jokulsarlon glacial lagoon and in the heavens. Photo by Martin Schulz. Me, Myself, Iceland and the Volcano! Iceland has always been a country in which I was interested, because its people and the forces of nature. Miles of stony deserts, barren and colorful highlands, vast glaciers and smoking lava fields. But the deepest impression of the forces of nature was left by the eruption of Eyjafjallajökull in 2010. I was very much impressed with how small you are as a human being when faced with such immense forces of nature and how well the people in Iceland dealt with it all. So I started to follow the news from Iceland quite closely when there were signs of an imminent volcanic eruption. 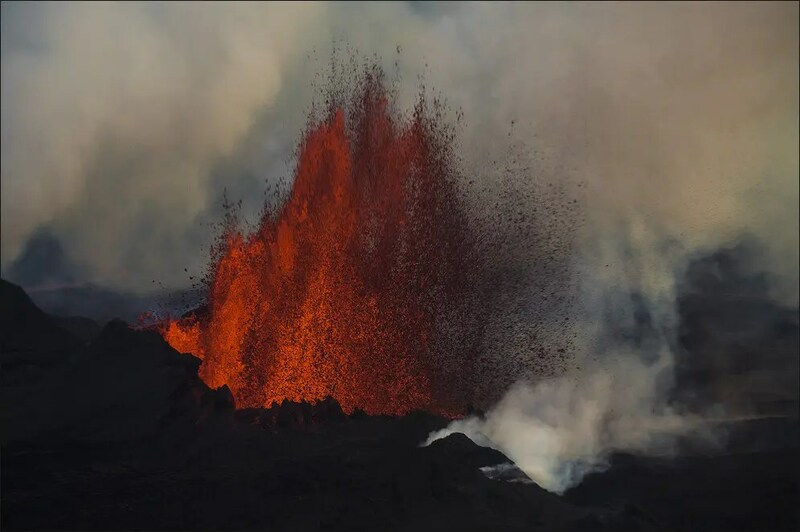 Bárdabunga, a large volcano under the icecap of mighty Vatnajökull glacier started to rumble. I was especially interested because our next trip to Iceland was coming up. 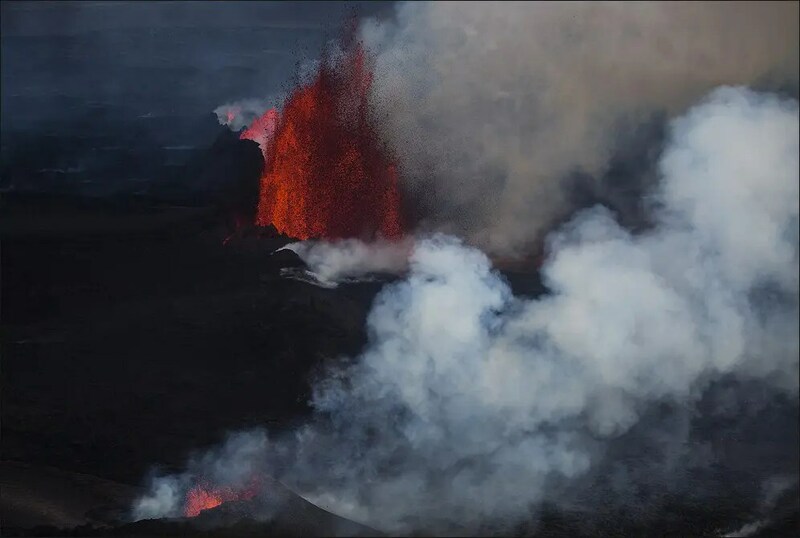 On the day we arrived the newspapers were full of articles about a smaller eruption north of Vatnajokull, right between Askja and Bárdabunga at an area called Holuhraun. 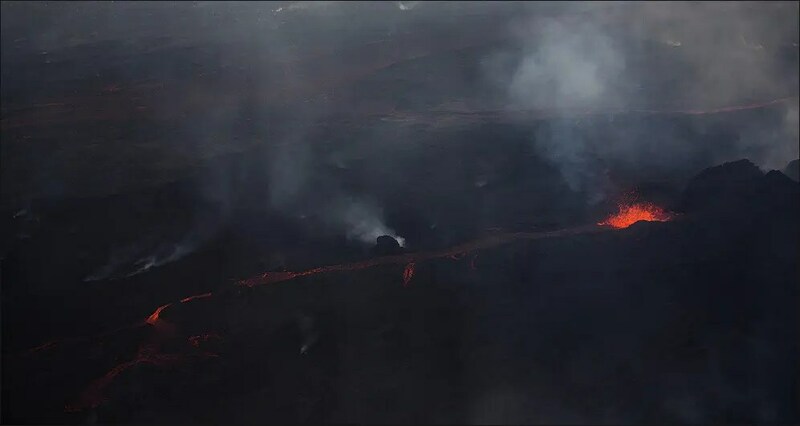 A one kilometer long rift had opened with high lava fountains. 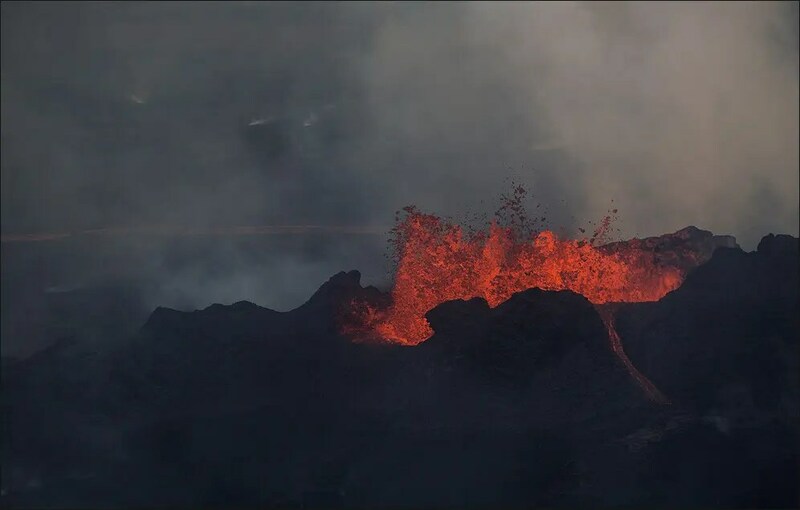 Since this was a quite small eruption that did not take place under the ice it was amazing to see the first pictures which were taken by the scientists at the eruption area. As we arrived some nights later at the Jökulsárlón area, south of Vatnajokull, the aurora forecast showed a the possibility of Northern Lights at level three. Because of the nearly cloudless heaven I decided to drive to the well known glacier lagoon to try my luck. The volcano was forgotten at the moment when I was standing at the lagoon, absolutely on my own and watching the first northern lights to appear on the heavens. Right after the first pictures I was wondering about the fact that every single image had a strange red glow right above the Breiðamerkurjökull glacier. At the first I thought that this might be the sun setting but it was at around one in the morning. Later the next day when I was talking to my wife about this glow, the topic of the Holuhraun eruption came up. After taking a look at the map we were absolutely sure that this reddish glow came all this way over the icecap of Vatnajökull, right from the eruption site. It was reflected in the light cloud cover and the glacier lagoon. A real once in a lifetime experience! In all the other nights in which I stayed at the lagoon that reddish shine was not visible. When staying in Iceland we never stopped reading the news about that volcanic eruption. 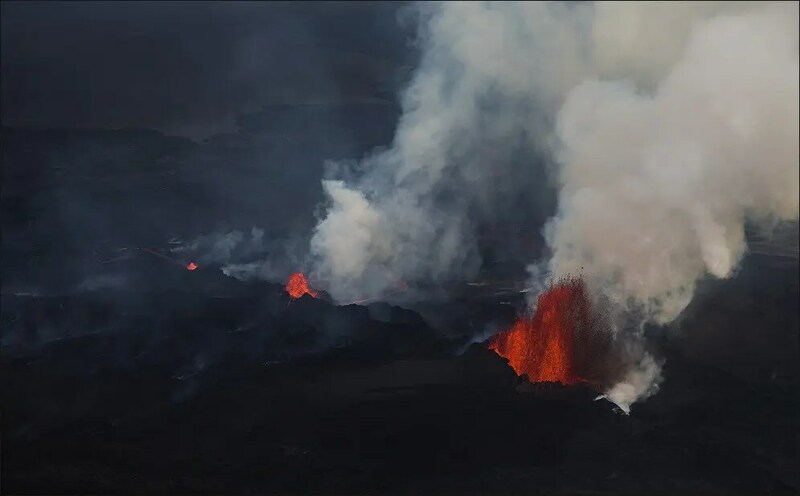 In the last day of our stay in Reykjavik we found a small company which offered us the possibility to fly over mighty Vatnajökull by plane and watch the eruption from above. In the middle of the night after a wonderful evening with Jón and his family we made our decision to go on to that flight. At 9:30 in the morning our plane left Reykjavik. Large clouds covered the skies and we were worried about that we would not see anything. But the closer we came to the eruption site, the weather and visibility improved. When we got the first look at the scenery it was really amazing. High lava fountains were going up into the sky, 30 to 40 meters high. We were really caught up by this scenery, seeing the bright red shine of the lava flowing and pouring out. 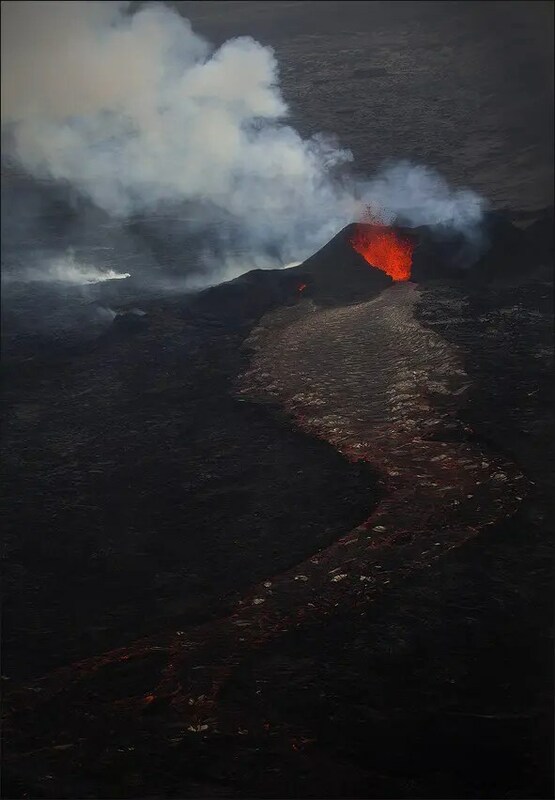 Our plane started to circle around the eruption site and for me as a photographer it was like a dream becoming reality. Again and again the immensely tall lava fountains splashed out from several craters, like in slow motion. To get the change to see again the manifestation of the power of nature up close was a real gift. It was incredible to see this untamed power of our earth. Words and pictures are by Martin Schulz. He is from Germany and has been addicted to Iceland since 2007. Martin has visited Iceland twelve times and explored it from the shore up to the highland interior. Martin works as an audiologist and maintains the IT infrastructure of a medium-sized enterprise. Martin is an accomplished photographer and focuses on work with filters (grey and graduated grey filters) and long exposure techniques. Martin has done voluntary work with hearing impaired children in Africa (Namibia) and likes beer, Whisky, rock and heavy metal music. You can explore his photography work on photograpy site and his web site and contact him directly if you are interested in purchasing his pictures. We are really grateful for his contribution. This is his second entry on Stuck in Iceland, previously he shared his experience of visiting Brúarfoss waterfall, Thingvellir, Breidamerkursandur beach and of course Mount Kirkjufell.